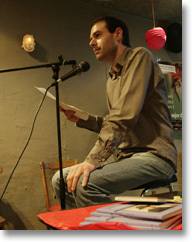 Catalan poet Ernest Farrés, born in Igualada in 1967, lives in Barcelona. A journalist who works on the cultural supplement of La Vanguardia, he has written three volumes of poems: Clavar-ne una al mall i l’altra a l’enclusa (1996), Mosquits (1998) and Edward Hopper (2006), which won the Englantina d’Or of the Jocs Florals of Barcelona. He has also edited an anthology of contemporary Catalan poetry, 21 poetes del XXI (2001). In Spain Edward Hopper has been adapted to the stage in both Catalan and Spanish. English versions of Farrés’s poems have recently appeared in Calque, The Nation, PN Review, Two Lines, Words without Borders, World Literature Today, and Zoland Poetry.